At our February 2017 Conference, the new Pensions Minister, Richard Harrington, set down the challenges for Member Nominated Trustees in a rapidly changing pensions world. 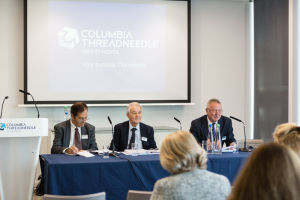 Our June 2017 Conference intends to expand upon the various issues facing DB and DC pensions and to interrogate the many risks threatening the future of members and their aim to achieve an adequate income in their retirement.Our summer Conference on 21st June 2017, will again be held at the offices of our very generous premier sponsor, Columbia Threadneedle, above Cannon Street Station. Last year this was one of our best attended events, so please respond early if you would like to attend, as places will be limited.Planning is already underway and we are hoping to attract some of the pension industry’s key-note speakers, including having the normal breakout sessions, at which Members can express their views and experiences on major trustee concerns. Topics have yet to be finalized, but will certainly include some highly relevant investment views. If you have any ‘pet topical subjects’, then please let us know. 21st June 2017 AMNT Conference – What should the future manifesto of Member Nominated Trustees be? The AMNT welcomes the opportunity to respond to the various consultation papers issued by Public Bodies and always appreciates your help in responding to these discussion papers on burning issues. Currently we are consulting on the Association’s response to the Green Paper, Security and Sustainability in DB schemes. a spotlight event on climate change risk led by Megan Clay of Client Earth. Work Place Pensions Live 2017 – 10 & 11/05/17: all day events to be held at Edgbaston Cricket Stadium. CPD Certificates now available for this event. The AMNT has taken on Caroline Davies as our Administrator to assist with the growing workload. Caroline brings a wealth of experience with her after twenty five years of working in higher education and in the last decade as an author. Caroline will be working on a part-time basis, alongside Kate Bendy and Bridget Hiluta. If you bump into Caroline, please introduce yourself and welcome her to the pensions ‘mad house’. Voting and ensure that their pension advisors and fund managers are doing their job in support of good governance and the environment. Red Line Voting now has a new Campaign Manager, Leanne Clements, so look out for more information once she has settled in. Request to all AMNT Members – The AMNT Management Committee is keen for Members to become more involved in pension issues, by giving their views or taking on-board specialist projects, in which they have an interest. We now have more than 700 members, representing nearly 510 pension schemes. To be effective, we need your help. What training do you want? – we have now held our first specific training event for MNT members on ‘negotiating effectively, communicating persuasively’ on 22/03/17. Quietroom, a “thinking, writing and training” company, who run open workshops for Trustee Boards and other Clients, helped us with this event. Further details about Quietroom’s activities can be found on their website – quietroom.co.uk – and it is our hope that this relationship may be developed further in the future. Please let us know your views about other training needs. Do Trustees fully understand what fees they are paying to their Fund Managers? The desire for transparency in the investment industry is important. It relates to all aspects of managing and running a fund, but recently much focus has fallen on the fees charged by investment managers. It would be easy to assume that this is a new problem, born of financial engineering and opaque trading practices. In fact, charges were far less transparent in the past – think of your average With Profits Fund, where the charging structure was far from clear, or many insured products which had initial as well as ongoing charges, often linked to commission payments to the adviser. Many funds also had “exit” penalties, leaving pension schemes locked in to investments (perhaps longer than appropriate). Having said that, current practice retains many complexities. What are the most common charges that pension schemes pay on their investments? There are a range of fees payable on each investment a pension scheme makes and whilst reporting has improved, the number of different acronyms that trustees must now familiarise themselves with has grown. AMC – The Annual Management Charge covers the costs of running and managing a fund. It is often the headline figure provided by investment managers. However, it is not the total cost of investment. TER – The Total Expense Ratio has been quoted alongside the AMC by fund managers for many years and trustees have become familiar with its usage. The TER cover the AMC plus the variable costs associated with running the fund, such as custodianship, transaction costs and administration. For many years, these two measures of costs have been used by pension schemes to assess value and measure performance net of fees. However, a new acronym has become the key focus, particularly for defined contribution (DC) schemes – the OCF. Most commonly used to demonstrate compliance with the Member Borne Deduction for schemes affected by the 0.75% charge cap. OCF – The Ongoing Charges Figure (OCF) is similar to the TER, but the OCF does not include performance fees and one-off charges such as transaction costs. An added complication is that some investment managers will quote the OCF, whilst others will only provide the TER. This generally depends on the structure of the fund, with UCITS compliant funds quoting the OCF and others solely the TER. This complicates matters for trustees, who will seek like for like comparisons across their investments. What other charges could be applied to investments? Performance fees – these fees are less common in traditional markets, but should not be ignored. A performance related fee essentially aligns the interests of the manager and trustees. Whilst these fees can appear high (e.g. 20% of any outperformance), remember that these fees are only paid when performance exceeds pre-determined measures. However, care should still be taken when implementing such fees to assess how and when they may be charged – a legal review of the fee agreement can be helpful. Care should also be taken for DC schemes to determine how such fees would be charged and equitably shared between members. MVA – The Market Value Adjustment is an adjustment that may be applied to an investment policy if the trustees fully, or partially, surrender the contract early. It is most commonly seen on With Profits contracts, but can apply to other policies. Whilst it is less common to see these policies today, it is important for trustees to understand whether they are invested in such an arrangement and the costs associated with transferring funds away. Whilst the proposed 1% cap on exit penalties is welcomed, it should be noted that this will not apply to With Profits policies. Platform fees – Some platforms can charge schemes for administration, or to provide additional reporting services. It is important to understand how platforms are remunerated and what services are offered for any fee paid. Fees are typically expressed as an additional AMC and are more common for DC schemes. However, platforms can offer access to a wider fund range and should not therefore be ruled out because of any platform fee. Fees for advice – Sometimes expressed as an AMC, particularly for fiduciary mandates, advisers’ fees are more commonly a fixed monetary amount. Trustees should ensure they receive “value” for any fees they pay, but it can be “penny wise and pounds foolish” to avoid advisory fees being incurred, as the advice can result in better outcomes for pension schemes. Don’t get too hung up on the cost of the investment. We advocate measuring performance on a net of fees basis, after all, that is the performance that the scheme will have achieved. Too much focus on fees can shepherd trustees into pure passive investments, which may not always offer the best value to pension schemes.